What is the Teamwork Compass®? It’s more than a logo, it’s a powerful system for helping your team be the best they can be. While it’s important for your team to have a lot of fun during their event, it’s even more important that they take away ideas that they can take action on. In order to give participants enduring tools that they can use after the event, we draw on the metaphor of a compass, with each direction representing one of the four areas of team success: Effectiveness, Innovation, Accountability and Trust. These four traits of the Teamwork Compass are based on the four primary thinking styles behind all of the personality profile systems. This leads to better understanding and implementation of the lessons from your team building experience by engaging the entire brain and drawing from everyone’s unique strengths. North (Blue) represents direction, effectiveness, staying on task, and evaluating your progress. How effective was your team at reaching its objective? How honestly and accurately do you measure your results? South (Red) represents warmth, relationships, and trust. How does your team support each other and create an environment where everyone can be at their best? Do you have a code of conduct that respects all team members? East (Yellow) represents the sunrise, new beginnings and innovation. How does your team explore new possibilities and approaches? How open are you to different ideas and taking risks? West (Green) represents the sunset, completion and accountability. How does your team assign various functions? How do you hold each other and your team accountable? The Needle represents focus. What is your team paying attention to? Are you more focused on problems or solutions? Obstacles or opportunities? Conflict or connection? And most importantly: where do you go from here? Our experienced facilitators will help your team observe and reflect on how they respond to the activities- and each other- in order to draw out lessons that they can apply in the future. By bringing the ideas out from the group, there is more ownership of the experience, and greater implementation of those ideas. 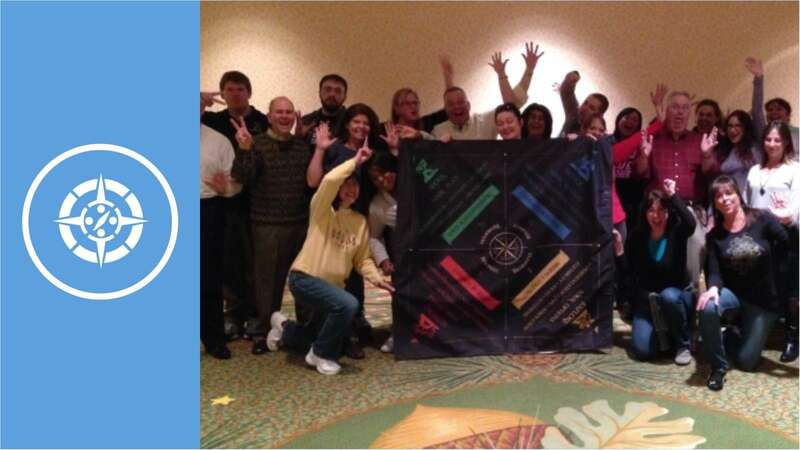 Each event shows the relative focus that program has on each element of the Teamwork Compass®. 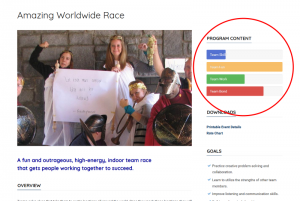 Look for the color-coded bars in the “Program Content” section on the upper right of each program page (just after the featured image on mobile). If you know you want a program focused mostly on one Compass element, you can search just that element. Use the grid below to seach by specific Teamwork Compass® elements. We have found the Teamwork Compass® to be a fantastic tool for teams to use together for reaching the next level. Our workshops go into the Teamwork Compass® and its 4 styles in depth. All of our Team Work programs also use the Teamwork Compass® as common language throughout the program, and as a debrief tool. Search for programs teaching the Teamwork Compass® in Team Skills and Team Work below.